A lifelong writer and practicing general surgeon, Stephen raises money through sales of Cliff Walking for organizations working to end spousal and child abuse. He grew up in the Northeast Kingdom of Vermont, attended Tufts University, receiving degrees in English (MA) and Biology. He attended medical school and surgical residency at the University of Vermont where he has been a Clinical Assistant Professor of surgery since 1988. He has published four books and many journal and magazine articles, both fiction and non-fiction. He enjoys communicating with readers through his website: www.StephenRussellPayne.com. Cliff Walking is a contemporary literary fiction novel written by Stephen Russell Payne. Prominent Maine artist, Francis Monroe, had been keeping a daily vigil ever since his wife, Rachael, had disappeared a year earlier while windsurfing in Penobscot Bay. He would blow out the whaler's lamp he kept lit at night and head out into the bay to the spot where she had disappeared. As he watched the sun rise, he remembered his wife's love of the early morning, and the loving moments they shared. But this morning, as he rowed his skiff back to shore, he noticed a stranger on his property -- a young boy stood silently examining the picture he'd left on his easel. It bothered Francis that the kid was studying his rendering of his wife's body, particularly her breasts. Then, when he spoke, Francis felt he was in the presence, somehow, of a kindred spirit, an odd thing for him to feel after so long apart from the rest of the world, particularly children. The boy's name was Stringer, and he and his mother had fled the California coast and landed up here on the rocky shoreline of Maine in an attempt to finally free themselves of Leland, Stringer's violently abusive dad. Francis recognized Stringer's artistic gifts and began to mentor and guide him. Then he met Stringer's mom, Kate, and between the mother and her son, Francis began to live again. 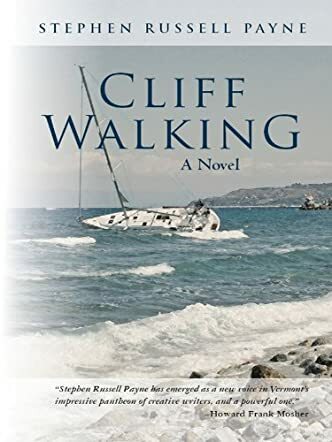 Stephen Russell Payne's literary fiction novel, Cliff Walking, is one of those genre transcending works that will appeal to so many and on so many different levels. It's a marvelous character study of the grieving widower artist whose soul had been buried under the waves with his wife since her disappearance. Francis is apart from the world until he sees that image of the slightly chubby boy standing before his easel. Payne's also crafted a stunning coming of age novel that focuses on Stringer, who comes of age in both the most trying and exhilarating of times. Kate's tale is one of redemption and healing. The three of them are towering presences in this tale, joined later by the trial attorney who sees in his defense of Stringer a chance to make right his own son's untimely demise. Payne had me hooked into the world of Winter's Cove, an idyllic small town nestled among the rocky shores of coastal Maine, but then he totally astonished me by including in this most impressive tale one of the most exciting and moving legal thrillers I've read. I was unable to tear myself away from the dialog as the prosecution and the defense called forth their witnesses. When the jury announced that they had reached a verdict, I was holding my breath. Cliff Walking is a brilliant debut novel that left me satisfied, yet definitely hungering for more from this gifted writer. It's most highly recommended.